We're not saying your great uncle Greg doesn't do some truly spectacular things with a string of Christmas lights. We're also not saying that explaining why you are both single and a vegetarian to your married, carnivorous relatives is not a rollicking good time. We are merely asserting that spending your holidays on a moving train in Alaska under the green glow of the Northern Lights is inarguably better. 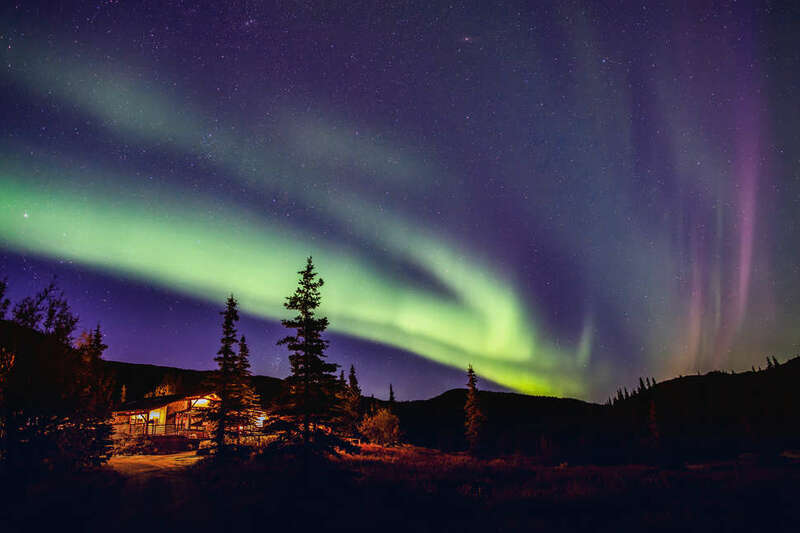 This year, Alaska Railroad is offering travelers the option to partake in an eight-day journey aboard the Aurora Train, routed to cruise beneath the wild spectacle of the Northern Lights for the full course of the excursion. The voyage begins in Anchorage, Alaska, where passengers will have some time to amble around town and visit the local stores. We imagine it's a great place to purchase ice fishing gear or an enormous rabbit fur hat. The following morning, the train will journey north towards the small town of Talkeetna, with an option to spend some time sight-seeing at Denali, which happens to be the highest peak in North America. Once in Talkeetna, patrons can take guided sled dog tours with an Iditarod champion kennel (these are the creme de la creme of sled dogs). Next, the train will rattle on towards Fairbanks, the state's largest interior city, showcasing some spectacular views of Denali National Park and the Alaska Range en route, before an evening tour of the Northern Lights commences. All that will be humbly followed by a morning trip to the Chena Hot Springs, where folks can gaze up at the dizzying lights from what is essentially nature's hot tub. We'd like to point out that this is obviously the coolest thing you will ever do in your life. If you're interested (you should be), the whole shabang will set you back $1,479 per person, which you may be able to make back by selling rare Alaskan ice fishing gear on eBay. The package will run through March 2019, and the very first pilgrimage will depart on December 25 (sorry uncle Greg). And fortunately, if you're not ready to head back home when your expedition reaches its finale, you can do the whole journey all over again in reverse, moving south from Fairbanks to Anchorage. Unlike the Aurora Package, the Borealis Package boasts the opportunity to sleep in a clear geodisc dome tucked away in a remote boreal forest region, which either sounds very good or very bad. This version of the scenic journey runs from December 22 through March 23 at $1, 639 per person, according to Travel Pulse. We guarantee that your holiday plans thus far are super lame, comparatively. Do with that information what you will.